Believe it or not, Jacques Tourneur's masterpiece Out of the Past once languished as a forgotten title, viewable after midnight between TV car commercials. Around 1972, 16mm prints could be rented from Films Incorporated for just ten or fifteen dollars. But it was soon rediscovered as one of the very best of the "new" category known as film noir. Robert Mitchum personified the iconic trench-coated image of the weary private eye, lost in a maze of intrigue and murder. In every genre there are films that transcend academic pigeonholing. One leaves a screening of this doomed romance with a profound appreciation of the corrupt but seductive noir vibe. A critic once pegged this picture as the perfect "annihilating melodrama." Almost everyone winds up as a corpse, and they're very entertaining on the way to the graveyard. Howard Hughes' favorite Mitchum has his big break here, playing the ultra-casual pre- hipster who could have taught Jack Kerouac a few things about the Beat life. Unappreciated Jane Greer plays her femme fatale as a self-contradiction in a tight dress, the irresistible woman whose real name is Trouble. 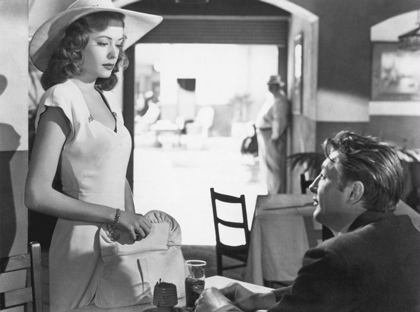 Mitchum's character knows that she's poison and she readily admits that there's only grief in their future. His answer is "Baby, I don't care!" The Warner Archive Collection has been picking out select library titles for Blu-ray release, and noir fans will be ecstatic over this choice. High Definition makes Nicholas Musuraca's B&W cinematography look as good as it did on the big screen. Contemporary critics admired Out of the Past even as some (including Bosley Crowther) complained that its second half was too difficult to follow. Daniel Mainwearing's screenplay opens with a lengthy flashback. Jeff Markham (Robert Mitchum) has changed his name to Bailey, opened a filling station in the Sierra Nevada town of Bridgeport and formed a promising relationship with local girl Ann Miller (Virginia Huston). But his traumatic past returns in the form of gambler Whit Sterling (Kirk Douglas) and his henchman Joe Stephanos (Paul Valentine). Jeff tells Ann about his past. Hired to retrieve Sterling's runaway girlfriend Kathie Moffatt (Jane Greer), Markham instead ran away with her. Only later did he discover that Kathie is both a thief and a murderess. His story (and the flashback) finished, Markham goes to Sterling's house at Lake Tahoe in hopes of making amends. He discovers that Moffatt has returned to Sterling. The gambler wants Jeff to go to San Francisco to recover some incriminating tax records from lawyer Leonard Eels, assisted by Eels' untrustworthy assistant Meta Carson (Rhonda Fleming). Markham has no choice but to oblige, even though he's obviously being set up. "I think I'm in a frame," says Jeff. "Doesn't sound like you," answers a friendly taxi driver (Wallace Scott). "I don't know," answers Markham, "All I can see is the frame." Out of the Past is a nearly flawless gem from beginning to end. Tourneur and RKO marshaled the standard elements of Geoffrey Homes' hardboiled novel and brought out the romantic side of noir in ways that previous tough-guy pictures had not. The characters are cynical but the movie is not. It aches with a failed romanticism forever defeated by greed, jealousy and pride. Low-rent detective Jeff Markham is a Philip Marlowe no longer searching for the honorable thing to do. When first interviewed by Whit Sterling's "big operator," he slouches in his chair as if nothing in the world could get his blood circulating. A $5,000 fee motivates Jeff to pick up the trail of a wayward girlfriend described by his partner as a "wild goose with 40 Gs." Good sleuthing leads Markham directly to his prey in Acapulco, where the Mexican heat, Roy Webb's seductively plaintive music and especially the sight of Kathie Moffatt take their toll. Jeff forgets his professional obligation along with his sense of self-preservation. Many movies ask if a love that will make us forget everything really exists, as the genie professes in The Thief of Bagdad. Out of the Past confronts us with the argument that romantic suicide may be the only way to live. In Jeff Markham's hazy reveries Kathie Moffatt is an idealized love object. When the narrative leaves flashback mode her aura vanishes in the harsh light of day. Kathie then elicits nothing but contempt from Jeff, who is all too aware of her treachery -- and the fact that she's still a very dangerous killer. Kathie sees things differently. In her view she loves Jeff deeply. Events just "happen" to force her to steal from Whit Sterling, blackmail Jeff and plot to have him killed. When caught in a bald double-cross, she squirms her way out. Jeff then catches Kathie framing him for murder. She comes back with sincere denials. "Save it," says Jeff: "You're like a leaf that blows from one gutter to another." Jeff claims otherwise, but we know that he'll just keep falling for her. By the last scene Kathie has made Jeff's future so hopeless that leaving her seems impossible. For better or worse they belong together. 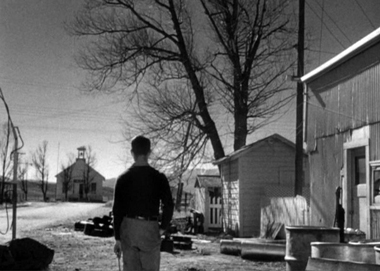 Daniel Mainwaring's script and Tourneur's polished direction keep Jeff Markham on the run. To stay ahead of Whit Sterling's murderous schemes, he's in constant motion between Lake Tahoe and San Francisco, from nightclubs to terrace apartments. Robert Mitchum accomplishes all of this while barely batting an eye. The rough stuff in Out of the Past is deliciously refined. One brawl is seen in shadows, observed calmly by the murderous Kathie: "Break his head, Jeff". Jeff dodges hoods with the help of a trusty Dashiell Hammett-like cabbie and wrests an important document from a fortified nightclub the way you or I would raid the refrigerator. For his best knockdown, Markham decks a thug with a throwaway uppercut and then pauses to cadge a cigarette. 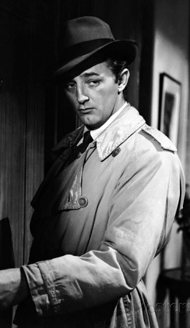 In theaters, Mitchum's casual stunt usually brings applause. Robert Mitchum brought a new kind of Cool to the screen in Out of the Past. He delivers most of his dialogue though eyes half closed. He must reach for his lighter or strike a match at least 50 times. The tobacco industry must have loved this movie, for the act of smoking looks too glamorous for words. Somewhere in San Francisco the plot does indeed thicken, with Mitchum moving a tad too quickly. On old twelve-inch television monitors the sultry Jane Greer and woo-bait Rhonda Fleming were difficult to distinguish in long shots. At one point Kathie identifies herself on the phone as Meta. The first time I saw the picture I thought the two women were one character until they showed up sharing the same taxicab. 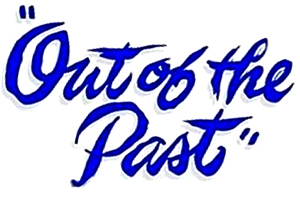 Out of the Past does have a clear story. It's just that watching the beautiful images and listening to the great dialogue is so pleasant, who worries about it? Kathie: "Did you miss me?" Jeff: "No more than I would my eyes." Stephanos: "You have fun pumping gas, huh?" Jeff: "Yeah, me and the kid laugh all the time." 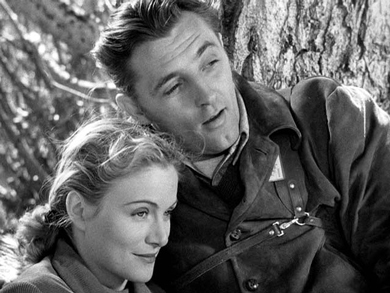 As an added kick, Out of the Past has an early performance from Kirk Douglas before he buffed out to play action heroes. His Whit Sterling shows a range between breezy insincerity to sullen anger. He can juggle the stylized dialogue too: "Think of a number, Joe." Sterling isn't the spineless weasel Douglas played in The Strange Love of Martha Ivers. He's also a long way from the broad histrionics of things like Detective Story. RKO cameraman Nicholas Musuraca shot the influential Stranger on the Third Floor and teamed with Tourneur under Val Lewton on the career making Cat People. Gentler with his lighting than the stark John Alton, Musuraca matched Tourneur's refined direction with images composed in depth, with a full range of tones. Even the exteriors around Mono Lake are aesthetically skewed. Any shot with Jane Greer is a portrait masterpiece. By the end of this tangle of convoluted betrayals and killings, Kathie's amorous treachery has painted Jeff into an impossible corner. Everyone's fate, even Jeff's, is resolved according to their inner nature. He stares out at dawn over the woods he loves so much and knows they're no longer a part of his future. He says, "Build my gallows high, baby" and wears his I-don't-care face to the bitter end. Jeff's young pal The Kid (Dickie Moore, everyone's favorite tot from early '30s pix like Blonde Venus) provides a coda with a generosity of spirit that nobody else in the story can muster. Out of the Past ends as an elliptical enigma. Specific crimes are resolved but the machinery of romantic fate remains a mystery. Out of the Past has always looked good on video but The Warner Archive Collection's new Blu-ray brings out the full impact of Nicholas Musuraca's fine cinematography. In 1977 the Los Angeles County Museum of Art held a full retrospective of RKO pictures, and showed an original nitrate print of Out of the Past that left us breathless. The movie has excellent second-unit work in Bridgeport, San Francisco and Mexico, seamlessly combined with Jacques Tourneur's studio work. A beautifully mixed original audio track (in DTS-HD Master Audio) gives Roy Webb's music added power. The insightful audio commentary is by James Ursini, who has been writing about film since the early 1970s and knows his way around a noir like few others. 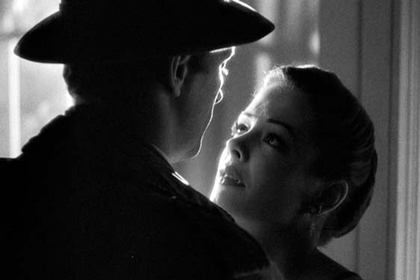 His talk dispenses some background information and uses the rest of its time to relate effects and situations in the movie to the classic noir pattern. The original trailer for this show appears to have been lost -- most trailers I've seen for older RKO pictures are duped re-issues. The WAC's disc case cover uses vintage poster art, which makes dreamy Jane Greer look more like Bette Davis in The Letter. The poster wasn't RKO's best, but I've never seen a still from the film that didn't look suitable to hang in a museum. 1. A few years back I rushed to buy a CD of Roy Webb's movie music that had some selections from Out of the Past. But the haunting, romantic main theme wasn't there. 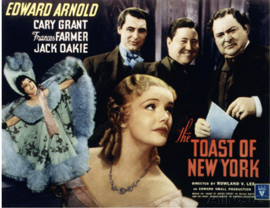 Not three or four months later TCM played a late '30s picture called The Toast of New York -- and it used the same musical theme. Actress Frances Farmer actually sings lyrics to it. Glenn, I, too, was haunted by that romantic theme from Out of the Past. When Frances Farmer played the harp and sang "The First Time I Saw You" in The Toast of New York (1937), I knew the lovely song was familiar. A few days later came one of those stopped-at-a-traffic-light epiphanies: Toast is an RKO picture . . . the theme was re-cycled for Our of the Past! P.S. I think it bold for '47 that Mitchum sits down at the table with Eunice and her date. Hi, Glenn: As always, great fun to read your reviews. The same musical theme we're talking about did indeed originate with The Toast of New York but it was also used extensively in RKO's Crack-Up a year before. All the best, Willard Carroll. 2. Some of the dialogue in Out of the Past also has an odd cadence, a quality Savant attributes to an unknown RKO influence -- a dialogue director? Nobody slurs anything. Each word of every line is articulated to match the phonetic description in a dictionary. When waitress Marny (Mary Field) yaks to her customers the word "counter" is said several times, pronounced "kown-ter" as if the film were meant for an 'English as a Second Language' class. Everyone I know this side of Shakespeare drops the "t" almost completely: "kown'ner." You'll find this to be true in almost every RKO film of the time. A drunk in On Dangerous Ground enunciates his words like Mister Rogers.